���� Tip� Two:� Improve� your� context� skills. Research� shows� that� a� lot� of words� are� learned� from context.� To� improve� your� context� skills� pay 112 close attention to how words are used. Doing a search on a word using dejanews.com (for searching newsgroups) will give you many examples of how that word is used in context. Play our Daily Context Vocabulary Quiz. ���� Tip� Three:� Practice,� practice,� practice. Learning� a� word� won't� help very� much� if� you� immediately� forget� it.� Research� shows� that� it� takes from� 10� to� 20� repetitions� to� really� make� a� word� part� of� your vocabulary.� It� helps� to� write� the� word� -� both� the� definition� and� a sentence you make up using the word - perhaps on an index card that can later be reviewed. As soon as you learn a new word, start using it. ���� Tip Five: Use mnemonics ( memory tricks). For example, consider the word EGREGIOUS (extremely bad). Think EGG REACH US - imagine we've made a mistake so bad that they are throwing eggs at us and a rotten EGG REACHes US. Such funny little word pictures will help you remember what words mean, AND they are fun to make up. Also, find out which learning style suits you best. Everyone learns differently! ���� Tip Six: Get in the habit of looking up words you don't know. If you have a dictionary program on your computer, keep it open and handy. America� Online� and� other� internet� services� have� dictionaries� and thesauruses on their tool bars. Find them and look up any word you are not absolutely sure of. Use a thesaurus when you write to find the word that fits best.� ���� Tip Seven: Play with words. Play Scrabble, Boggle, and do crossword puzzles. These and other word games are available for the computer, so you are not dependent on a partner to play. Also, try out the Franklin Electronic Dictionary that features built-in word games. ���� Tip� Eight:� Use� vocabulary� lists. For� the� serious� vocabulary� student, there are many books that focus on the words most commonly found in standardized� tests,� such� as� the� SAT� and� GRE.� There� are� also� many interesting� word� sites� on� the� Internet,� many� of� which� will� send� you� a word a day by e-mail. 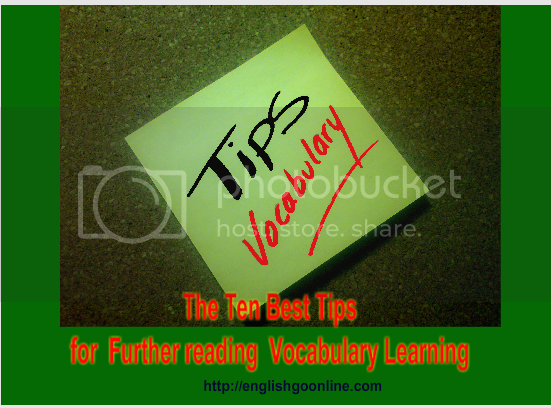 ���� Tip Nine: Take vocabulary tests. Playing games, such as the ones on this� site,� that� test� your� knowledge� will� help� you� learn� new� words� and also� let� you� know� how� much� progress� you're� making.� Offline� sources for vocabulary tests include SAT or English Vocabulary in use. ���� Tip Ten: Get excited about words! Come to appreciate the sometimes-subtle� differences� between� them.� Do� you� know� the� difference� between something� that� denotes� something� else� and� something� that� connotes something else? If not, go look it up. Learn to say what you really mean and discover the joys of being able to express yourself in writing. Your future can depend on how rich your vocabulary is.